When Yazeed Ibn Muawiyah sent AI-Husayn Ibn Numair with his army to Makkah AI-Mukarramah to fight Ibn Al-Zubair, he subjugated the whole of Makkah AI-Mukarramah except the Holy Mosque. Ibn AI-Zubair and his companions took refuge in the Holy Mosque, and built shelters with reed stalks round the Holy Ka'bah, and also wooden structures to protect them from the heat of the sun and from the stones hurled from the catapults outside. The building of Ibn Al-Zubair. The right figure was designed by the calligrapher Al-Sheikh Muhammad Tahir AI-Kurdi. AI-Husayn Ibn Numair erected catapults at the top of Mount Abu Qubais and Mount Qa'iqan to throw stones at the Holy Ka'bah. The kiswah was torn to pieces and the stones of the Holy Ka'bah began to shake. One of Ibn Al-Zubair's companions lit a fire, and a spark flew off and set alight the Holy Ka'bah. At that time the Holy Ka'bah was built in the Quraishistyle. a layer of wood followed by a layer of stone. This took place on the evening of Saturday, the third of Rabic AI-Awwal, 64 H. The stones of the Holy Ka'bah scattered far and wide. to the extent that small stones flew under the feet of the birds and pigeons that had flown in the direction of the walls of the Holy Ka'bah. When the news of the death of Yazeed Ibn Muawiyah arrived, AI-Husayan ended the siege and left Makkah with his army on the fifth of Rabic AI-Thani in the same year. It was then inevitable that the Holy Kabah had to be pulled down and rebuilt. Ibn AI-Zubair consulted wise and experienced people concerning this problem. He finally decided to demolish and rebuild the Holy Ka'bah. He reconstructed it on the foundations of Abraham (peace be upon him), thus fulfilling what Prophet Muhammad (blessings and peace be upon him) had hoped for. He collected the stones from the same mountains from which Quraish had built the Holy Ka'bah, Hira, Thabeer, AI-Muqatta, AI-Khandamah, Halhala, Ka'bah and Mardalla. When lbn AI-Zubair prepared all of the building materials, he took the ornaments and other things from the inside of the Holy Ka'bah and put them at the house of Shaiba Ibn Othman till he finished the building. Ibn Al-Zubair was the first person on top of the building, and he himself started demolishing it on Saturday, 15th Jumada AI-Thani, in the year 65 H. People followed him, and the building was completely demolished by midday. lbn AI-Zubair then picked up the Black Stone, wrapped it in silk, put it in a casket, sealed it and took it to Dar AI-Nadwah for safekeeping. He set up pieces of timber, wrapped in cloth, around the Holy Ka'bah, for people to circumambulate. When the foundations of the Sacred House were excavated, it was discovered that it was six cubits and a hand span inside Hip Ismail. The base stones were intertwined. Changing the site of Hijir Ismail necessitated the removal of all the foundations and corners. Ibn AI-Zubair then summoned fifty notable citizens to witness that he had based the building on the original foundations of Abraham (peace be upon him). He set up the eastern door of the Holy Ka'bah one base higher than AI-Shadhrwan which is on the ground, and the western door was parallel to the eastern door at the back of the Holy Ka'bah and opposite to it. When the building reached the site of the corner, the Black Stone was put in its place unobtrusively. 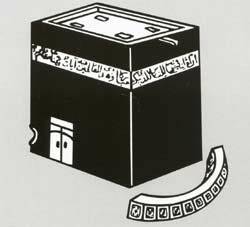 He increased the height of the Holy Ka'bah to twenty-seven cubits and the width of the wall by two cubits. He put in three pillars in one row to support the ceiling from north to south, and he built the ceiling of the Holy Ka'bah with marble brought from Sana'a. He made two leaves for the door of the Holy Ka'bah instead of one. The height of the door was eleven cubits. He built a zig-zagged staircase made of wood inside the Holy Ka'bah at the Shami corner. These stairs led to the roof on which a waterspout pouring into Hijir Ismail was fitted. After he had completed the building, he perfumed the interior of the Holy Ka'bah with ambergris and musk. He painted the exterior wall with musk from top to bottom and screened it with silk curtains. There remained some stones which he spread ten cubits around the Sacred House. The building was completed on the 17th of Rajah, in the year 65 H. On this occasion, he encouraged people to perform Umrah from Al-Taniem in gratitude and thanksgiving to Allah, the Almighty. He also encouraged them to slaughter, if they could afford it, as almsgiving for Allah's kindness and generosity. Ibn AI-Zubair and his companions then put on their ihrams and commenced their Umrah from a hill in front of A'isha's mosque. He slaughtered a number of camels as charity in praise and gratitude to Allah, the Almighty. Makkans then started to perform 'Umrah' annually on this very day.